Most Americans don’t watch or pay attention to cable television. In even a good news night, about five million people take a seat on the cable wars, which is less than 2 percent of all Americans. People are scared of what they see in their pay envelopes and neighborhoods, not because of what Keith Olbermann said last night or how Bill O’Reilly came back at him. This Malcolm calls a “brutal truth”. But is this really true? And what sort of truth is it? Five million may be 2% of all Americans, but is it the same 2% that “take a seat on the cable wars” each night? Malcolm and Carr do not tell us. Even as a percentage of households, this audience amounts to only 5%, but this ignores the vaunted “network effect”. In other words, what of the influence of this audience as they disperse into workplaces, Starbuckses and Elk Lodges to magnify the voices of their liking? In polling the citizenry on the bizarre notion that Barack Obama is a Muslim, the Pew Research Center (about as reputable as polling outfits get, from what I can tell) found that 18% of Americans subscribe to this idea and 43% say “they do not know what Obama’s religion is”. And only 46% of Democrats are of the opinion that Obama is a Christian. When asked how they learned about Obama’s religion in an open-ended question, 60% of those who say Obama is a Muslim cite the media. Among specific media sources, television (at 16%) is mentioned most frequently. Beliefs about Obama’s religion are closely linked to political judgments about him. Those who say he is a Muslim overwhelmingly disapprove of his job performance, while a majority of those who think he is a Christian approve of the job Obama is doing. Those who are unsure about Obama’s religion are about evenly divided in their views of his performance. A summary consideration of the matter also hints to us that pocketbook/neighbourhood issues (the concerns contrasted by Carr against the screeds of cable commentators) are not mutually exclusive with the opinions expressed on television. Often, it is in these media that personal experiences of economic or security concerns are corralled into political viewpoints. The world of polling is a murky one. Outside of psychology and economics, it may be the only proclaimed mathematical/scientific enterprise where participants can arrive at wildly variant conclusions, and not have their predictions subject to validation by reality. FiveThirtyEight is a political blog (now part of the New York Times) that has of late shed some long overdue light (in the form of analytical rigour) into these turbid waters and withstood the test of empirical validation. Paul Krugman said he sees about a one-third chance the U.S. economy will slide into a recession during the second half of the year as fiscal and monetary stimulus fade. [A] key element lacking in the talk of double-dip recessions is what actually caused past recessions – that is, what are the primary reasons an economy slows to the point where its growth contracts for at least two quarters – followed by an analysis of whether those conditions exist in the current economic environment. Perhaps the most obvious economic indicator of a coming recession is rising interest rates, one of the primary policy tools available to the Federal Reserve. According to generally accepted wisdom, the Fed is supposed to lower interest rates during a recession to spur lending and loan demand, and then raise interest rates after the economy expands to prevent inflation from getting out of hand. Finally, the chart shows that short-term interest rates are the lowest they’ve been in over 50 years, an event that typically occurs as the economy is exiting a recession, not entering one. To summarise, if the Fed’s interest rates are going up, that indicates a recession is on its way, and if the interest rates are at historic lows, that indicates the economy is exiting a recession. Recall, at this point, that Stewart’s stated desire is to shift the conversation to causes, reasons and conditions that lead to a recession. This is poorly served by launching his analysis with talk of “indicators”, in particular the correlation of Fed interest rates with GDP change. Indicators are, after all, not causes. Unless Stewart believes that Fed jacking up of the rate is a cause of recessions! In fact, there is some reason to suspect that he might indeed believe that interest rate hikes lead to recession: when he does embark on examining causes, he starts out “Another leading cause of recession is some type of financial crisis” (emphasis mine). But the idea that Fed interest rate variations is the first [listed] cause of recessions is hardly established by charting its behaviour in relation to the state of the economy. After all, one of the first rules of statistics is, as I am sure Stewart knows: correlation does not imply causation. This is made only worse that Stewart can call upon only one data point — the recessions during the 1980s — that pertain to a double-dip recession. As Stewart himself tells us, interest rates are used by the Fed as a corrective measure to temper an over-heating economy (“irrational exuberance” as one Fed chairman in recent history put it). In that sense, rising interest rates can be more legitimately interpreted as a trailing indicator of an economy heading deeper into unsustainable territory. All through the growth of the Internet bubble starting from about 1995 all the way to the turn of the millennium, interest rates held steady, gaining about a modest percent between 1999 and 2001. Stewart could appeal to this small rise as being a cause, or even an indicator of a coming recession; but that ignores the majority of the mischief that had occurred by the time this hike was put in place: the eToys IPO, which closed on opening day at three times the start price, occurred in May 1999. The Netscape IPO which made millionaires out of early employees and investors, and paupers of the rest, pushed the infant software vendor up to a total valuation of around $2 billion in 1995. Any number of examples of such speculative excess that preceded the rate hike (and subsequent recession) can be obtained by looking up relevant data for familiar “.com” darlings from the era. Japan experienced recessions in mid-1993, mid-1997 and early 1998 (a double dip! ), most of 2001 and 2008-2009. 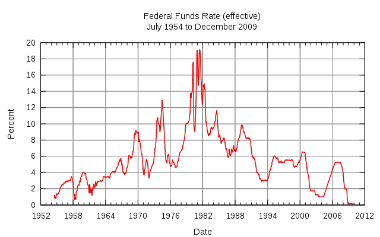 In line with Stewart’s expectations an interest rate peak in 1990-1991 coincides with the economy’s slide into recession. However, things turn less predictable thereafter. Apart from rare fractional upticks, the interest rate takes a controlled descent to zero, but with no significant impact on the economy, which has since that fateful event remained in the doldrums with intermittent recessions to add salt to the wound. Two out of the three listed causes reveal the consumer driven nature of the current US economy. That should be worthy of some attention when we attempt to understand the cause of recessions. Be that as it may, at least two (the first and last) are themselves outcomes rather than causes. Financial crises and bubbles, being the result of untrammelled speculation and/or lack of responsibility or accountability, can be symptomatic of the underlying nature of the market in which they arise. Whatever the precise causes of the housing bubble, it’s important to realize that bubbles in general aren’t at all unusual. On the contrary, as Yale’s Robert Shiller explained at length in his justly celebrated book, Irrational Exuberance, they are a recurring feature of financial markets. Minsky’s theory, in brief, was that eras of financial stability set the stage for future crisis, because they encourage a wide variety of economic actors to take on ever-larger quantities of debt and engage in ever-more-risky speculation. Stewart, in his blog post, mostly eschews such fundamental considerations, taking comfort instead in numbers that indicate that the current set of crises, measured by the criteria of bank earnings and commodity prices, are under control, to conclude that the economy is on the mend — or at the least not facing another recession. Let’s be clear: a recovery that involves growth so slow that unemployment and excess capacity rise, not fall, isn’t really a recovery. If we have only have 1 1/2 percent growth, that will amount to a double dip in all the senses that matter. Indeed, when I trained in economics, Malthusian reasoning was a target of mockery, held up by my professors as an example of a naïve forecast gone wildly wrong. After all, since Malthus’s time, incomes per person averaged around the world have increased at least an order of magnitude according to economic historians, despite a population increase from around 800 million in 1798 to 6.7 billion today. Some economists have gone so far as to argue that high and rising populations have been a major cause of increased living standards, rather than an impediment. In that interpretation, the eightfold increase in population since 1798 has also raised the number of geniuses in similar proportion, and it is genius above all that propels global human advance. A large human population, so it is argued, is just what is needed to propel progress. Yet the Malthusian specter is not truly banished—indeed far from it. Our increase in know-how has not only been about getting more outputs for the same inputs, but also about our ability to mine the Earth for more inputs. The first Industrial Revolution began with the use of fossil fuel, specifically coal, through Watt’s steam engine. Humanity harnessed geological deposits of ancient solar energy, stored as coal, oil, and gas, to do our modern bidding. We learned to dig deeper for minerals, fish the oceans with larger nets, divert rivers with greater dams and canals, appropriate more habitats of other species and cut down forests with more powerful land-clearing equipment. In countless ways, we have not gotten more for less but rather more for more, as we’ve converted rich stores of natural capital into high flows of current consumption. Much of what we call “income,” in the true sense of adding value from economic activity, is actually depletion instead, or the running down of natural capital. These are all phenomena in which one observes underrepresentation, and I think it’s important to try to think systematically and clinically about the reasons for underrepresentation.